It is estimated that 46.8 million people worldwide are living with dementia, with Alzheimer’s disease the most common form. 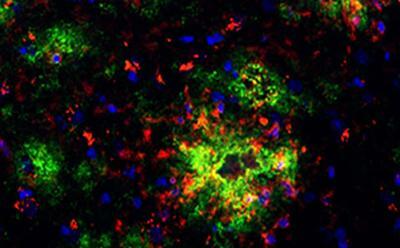 Now researchers from the University of Southampton have discovered a possible solution for side effects seen in immunotherapy treatment for Alzheimer’s. Immunotherapy is a promising strategy for the treatment of Alzheimer's that uses antibodies to stimulate the immune system to remove pieces of a protein called amyloid beta which accumulates in the brain (in deposits known as plaques) and is thought to be a major factor driving Alzheimer's neurodegenerative effects. Antibodies directed against amyloid beta have been able to successfully clear plaques and reverse cognitive deficits in mouse models. However, despite this success, clinical trials using these antibodies caused inflammatory side effects in the brain of Alzheimer’s patients, in particular amyloid-related imaging abnormalities (ARIA), which results in small bleeds and dangerous brain swelling. The multidisciplinary Southampton team, led by Dr Jessica Teeling, and in collaboration with Lundbeck (a multinational pharmaceutical company based in Denmark), engineered three antibodies to change the way they engage cells in the immune system. They found that small but precise changes in the anti-amyloid antibodies preserved the immunotherapeutic activity without the inflammatory side effects. While these results underline the potential of antibodies to destroy disease-causing plaques in patients and provide possible future treatments, they also indicate that further work is needed to increase antibody potency, but without increasing inflammatory side effects. The study was published in the journal Acta Neuropathologica and was funded by the Medical Research Council (MRC).